VR and AR, if planned and executed well, can be powerful platforms for brands to build and enhance their customer experiences. As faster, smarter and more affordable mobile phones become accessible to consumers across the globe, the use of mobile internet and apps have also seen an exponential growth. Internet usage on these devices is on a constant rise, and service providers are introducing newer plans with more data (internet) than talk and text services. A recent report by the Telecom Regulatory Authority of India stated that as of May 2017, in India alone, there were over 1 billion active wireless subscribers. This influx of mobile phones and demand for mobile internet has further lead to an explosion in the mobile apps development market as more and more businesses are going mobile in order to tap this customer base. Ninad Chhaya, COO of WITS Interactive and COO of GoPhygital believes that current generations have adopted a new way of life since the launch of mobile apps, everything from capturing memories in the form of pictures or videos and sharing them instantly on social media platforms, to daily errands like catching a taxi or having food delivered to your doorstep, all are done with the tap of a button through an app. It's safe to say, mobile apps have now become an integral part of daily lives of most mobile users and it is hard to imagine a life without them. It’s been almost a decade since the Apple App store was introduced, and when it launched, there were 500 hundred apps available to download, according to Apple Insider. 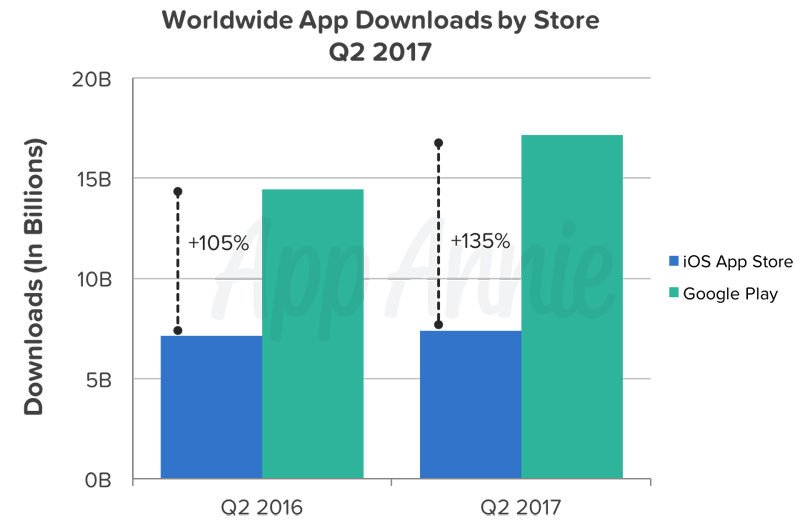 In 2017, statista states that there are more than 5 million apps available across all app stores like Google Play, Apple App, Microsoft, etc. ranging from utility apps to sophisticated interactive games. According to App Annie, India surpassed the US in 2016 to become the largest market for Google Play downloads. India not only held onto the top spot in Q2 2017, but it widened its lead as it experienced the quarter’s largest year-over-year market share growth of Google Play downloads. Mobile apps have dominated our lives for almost decade now, so what’s next? With the global hype and success generated by Pokémon Go, an Augmented Reality (AR) app based on the popular TV series and video game, Virtual Reality (VR) and Augmented Reality apps are expected to become one of the most talked about developments in the mobile app industry. Considered to be unreal promotional tools for several years, AR and VR application developments are something to watch out for in the years to come. As compared to a regular mobile app, which most businesses use as current means to engage with their users, VR and AR have the potential to give a greater emotional resonance to objects and topics. Virtual Reality and Augmented Reality, if planned and executed well, can be powerful platforms for brands to build and enhance their customer experiences. Moreover, with the soon to be released ARKit from Apple for iOS devices, developers have been busy playing around with ARKit and have already rolled out a number of cool demos. These demos give us a glimpse of what’s to come, and the future looks very promising. In addition to AR and VR, there are other technologies such as Artificial Intelligence (AI), Chatbots and Machine Learning which are also considered to change the mobile app landscape. In a recent article published by The Wall Street Journal, it talks about how “the next billion”, a wave of newcomers to the internet and mobile devices, are avoiding texting, and replacing it with communication through voice recognition, images and videos. Technology changes are always just around the corner and mobile apps need to be in accordance with the latest trends/technologies so that they can reap the benefits. There is a growing market for immersive tech, and with the promise that Virtual Reality, Augmented Reality, Artificial Intelligence, Chatbots etc. applications can deliver, business should leverage these technologies as it will bring about a transformation in approaching ideas/experiences that could possibly disrupt the current business landscape.